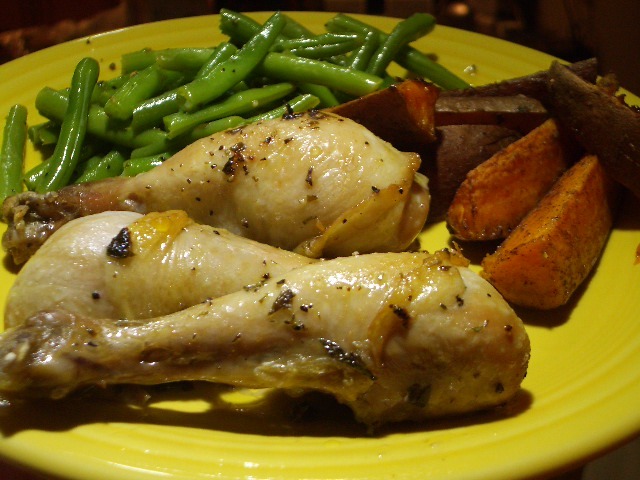 Arrange the drumsticks on a large baking sheet with edges. Rub the chicken with the salt and pepper. In a small bowl, mix the olive oil and juice from the lemons. Chop the tarragon, and whisk into the lemon and olive oil. Slowly pour the lemon tarragon mixture over the chicken, being sure to douse each drumstick with the good stuff. Bake in the oven for 40-45 minutes, serve, and ENJOY!